Every so often, I like to challenge myself with my baking - learn a new technique, gain a few more skills, and just see how far I can go. That's the case with the recipe I saw for Cinnamon Pear Twist Bread. 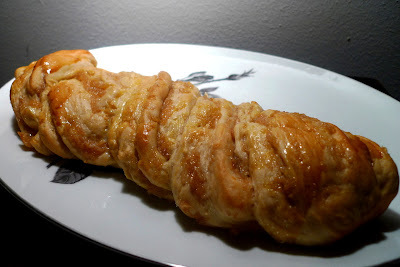 Seriously, a twisted bread looks so neat. I've made sweet rolls before, but I've never done a twist. I couldn't wait to try it. I did make a number of changes, all of which can be seen in red below as well as in my Notes. As for how to go about making this bread, I'll tell you what I did. To make this twist bread, you go about it just as if you were making sweet rolls (and you can actually do just that after you've rolled it into a log). But, if you want to challenge yourself, then go for the twist. At first, when I was studying the recipe, it was almost enough to make me go 'round the twist (as they say in Australia). I just couldn't figure out how to proceed. But, after looking at pictures of this recipe on numerous blogs, I finally figured it out. Apparently, you slice the log in half lengthwise, just as if you were cutting a marrow bone straight down the middle so you can see the insides (not that I've ever cut a marrow bone, but you get the point). The original recipe then tells you to "twist or "braid" the two logs together, working from the center to each end." But, in case you're like me and that makes absolutely no sense, you can do what I did - lay the two halves on each other, like an "X", and then start to twist each part down from where they join in the center. I highly recommend that you transfer the log to whatever pan you're going to bake it on before you cut it in half. It's just easier to transfer that way. Then, you don't have to worry about juicy dough or filling toppling off. Once you've mastered the twists, you'll be left with gorgeous loaves. And, they taste every bit as good as they look. 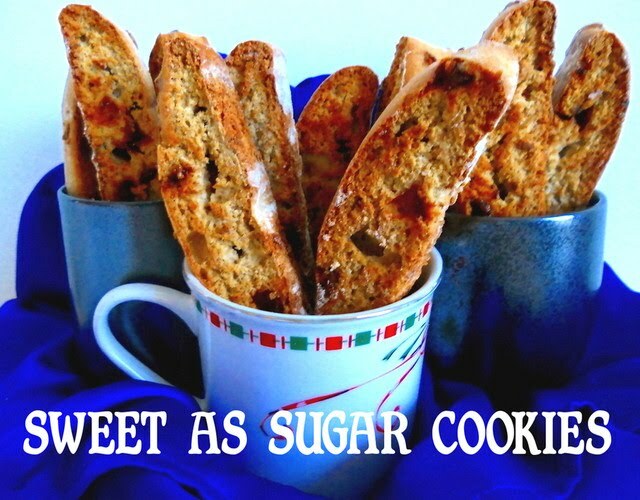 The sweet mellowness of the pears is perfect with the super soft bread around them. 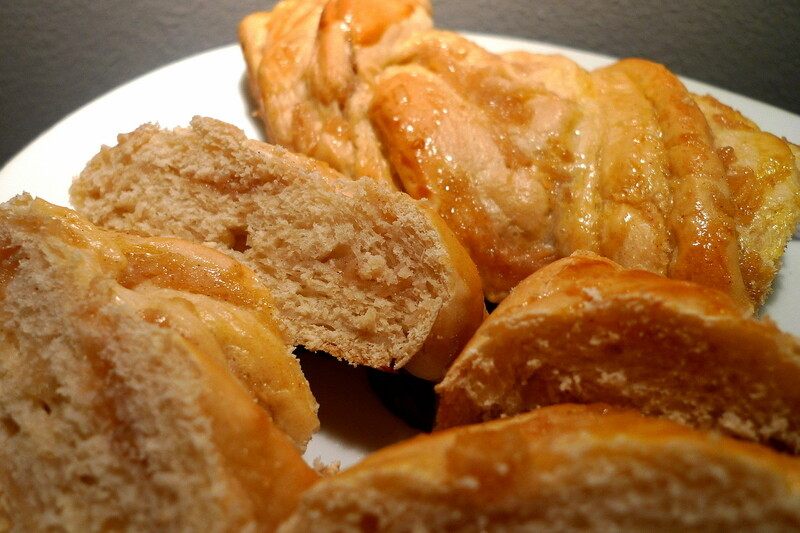 It's like a strudel in bread form. The original recipe calls for a glaze to be put onto the bread, but I think the bread is sweet enough without it. This totally makes for one delicious breakfast, or a beautiful gift to someone else, or a (healthy) snack. I'd definitely make this again! Combine the warm water with the yeast and a pinch of sugar and let sit until foamy, about 5 min. Combine the yogurt with the melted butter and sugar and mix well. Add the yeast mixture and mix in the egg and vanilla. Add the salt and 1 cup of the flour and mix well. Continue adding flour gradually, 1/2 cup at a time, until the dough no longer sticks to the bottom of the bowl. Turn out onto a floured surface and knead the dough, adding flour as needed. Keep kneading the dough until it is smooth and elastic and passes the windowpane test (i.e. if you pull off a small piece of dough and stretch it with your fingers, you should be able to see a translucent membrane). Put the dough into a well greased bowl, cover with plastic wrap, and let rise until doubled in volume, about 1 1/2 to 2 hours (or 4 hours in the fridge). Whisk together the sugar, flour, cinnamon, and ginger. Toss the grated pears with the lemon juice, strain out the excess liquid, and add the pears to the flour and sugar mixture. Mix well and set aside. Gently deflate the risen dough. Turn it out onto a lightly floured work surface. Divide the dough in half and roll the first half into a 10 x 12 inch rectangle. Spread half the filling over the dough, leaving a 1/2" margin along all sides. Roll the dough into a log, starting from the long side, then seal the ends. Cut the log in half, lengthwise, with a sharp knife (so that you can now see all the filling on the insides). Place each half, filled side up, in an "X" shape in a parchment-lined baking sheet. Starting from the center, twist the two pieces together and pinch the ends. Repeat with the second piece of dough. Allow the loaves to rise for about 30 min., covered lightly with greased pieces of plastic wrap. Preheat the oven to 350F and bake the loaves for 30-35 min. until they're lightly browned. When done, remove from the oven. The original recipe called for 1 cup of milk. I didn't have any, so I subbed in 1/2 cup nonfat Greek yogurt + 1/2 cup warm water. I used active dry yeast instead of instant, hence the proofing step, and also increased the amount from 1 1/2 tsp. to 2 1/2 tsp. For the filling, I used some brown sugar in place of white sugar and added some ginger as well. I recommend straining the liquid out of the pears after adding the lemon juice, so that it won't be too runny. The original recipe said to let the twisted loaves rise for 1 1/2 to 2 hours, but mine were perfectly risen and ready to bake after 30 min. The original recipe called for letting the loaves cool for an hour after baking, then drizzling them with a powdered sugar glaze. I like them better without the glaze and think it's tastier when eaten warm, just out of the oven. I found out a month ago that it would be my turn to make the cake to celebrate the March birthdays in my girls' youth group. I've been dreaming about making this cake ever since. The original recipe comes from the KRAFT website. However, I knew that I'd want to change things up a bit. To start with, I used my go-to chocolate cake recipe instead of a boxed mix. I also decided to slice each cake into two layers for filling, which would give me a four-layer cake. Then, for the filling, I wanted it a little sweeter and more vanilla-y, so I added some powdered sugar and vanilla. 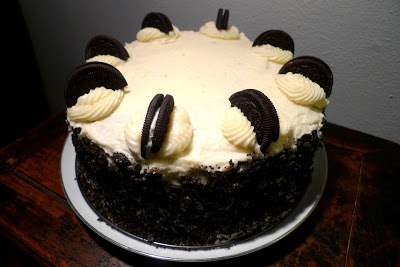 Finally, instead of covering the cake with melted chocolate, I decided to use vanilla buttercream instead. This cake is definitely a labor of love. From start to finish (making the components, baking, decorating), I think it must have taken me over two hours. But, it is so worth it. The chocolate cake is perfectly moist and chocolatey. Then, you have a whipped cream cheese filling chock full of Oreo cookies (three layers of filling to be exact). Plus, a vanilla buttercream frosting that tastes exactly like the cream in the Oreo cookies. If I ever need another chocolate birthday cake again, you can bet I'm making this one! I hope my girls like it as much as I do. Grease and flour two 9-inch round cake pans. Cut out parchment paper to fit in the pans and grease and flour the parchment paper too. Combine the melted butter with the sugars. Beat in the eggs and vanilla. Mix in the cocoa powder, baking soda, and salt. Add the flour alternately with the hot water, beginning and ending with the flour. Pour into the cake pans (about 3 cups of batter per pan). Bake at 350F for 25-30 min. until a toothpick comes out clean. Let cool in cake pans for 10 min., then remove and let cool completely on wire racks before filling and frosting. For the filling: Beat cream cheese with sugar and powdered sugar. Add the vanilla. Stir in the Cool Whip and crushed cookies. For the frosting: Beat the butter with the powdered sugar until light and fluffy. Add in the vanilla and mix well. Add milk as needed until you reach your desired consistency. Slice each cake layer in half, horizontally, to form two layers. 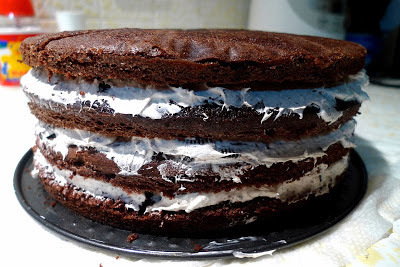 Place one cake layer on a plate and frost with one-third of the filling. Continue repeating with the rest of the layers. 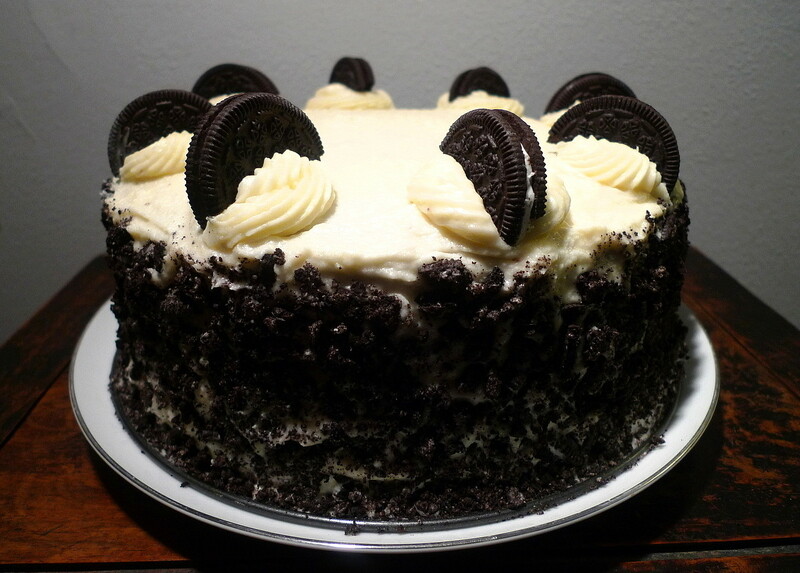 Frost the cake with the buttercream frosting. 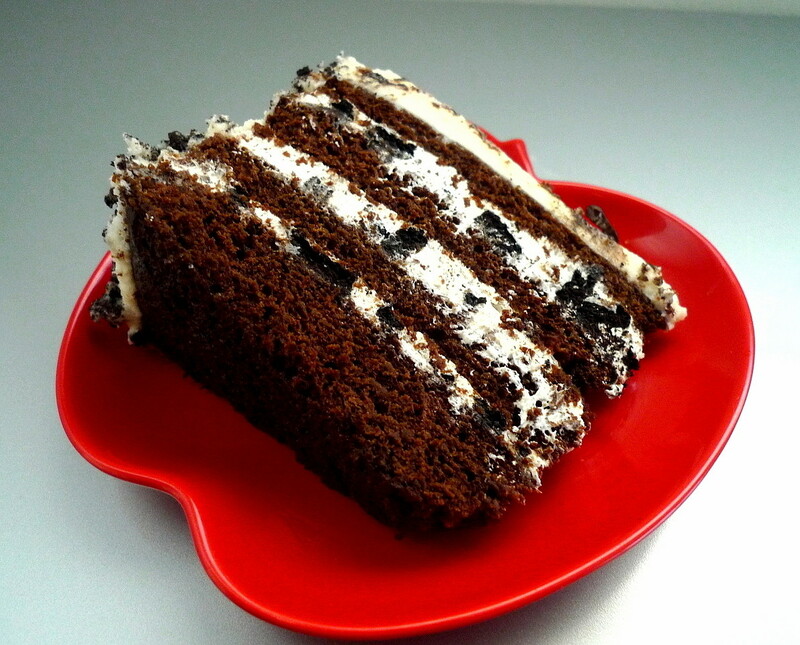 If desired, cover the outside of the cake with crushed Oreo cookies and use more cookies for the top. For this month's Secret Recipe Club, I was assigned to the blog, Keenan Cookbook. Chris and Rachel started their blog as a way to record all their special family recipes. As they say, no more index cards, notebooks, etc. I can definitely relate to that. And I love that they're so willing to share their "secret" recipes, passed down from generation to generation, all filled with delicious memories. 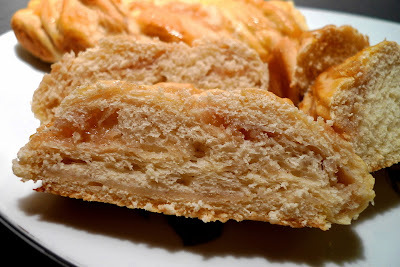 I had decided at first to try their Apple Upside Down Bread, a Keenan family original. 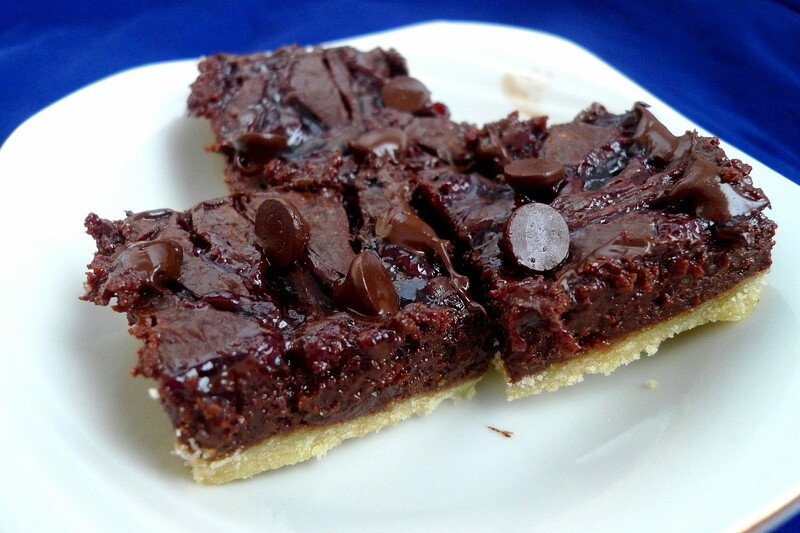 But, since I was in the mood for cookies one night, I turned to the recipe for Raspberry Chocolate Shortbread Bars. Strangely enough, just hours after I had finished making the bars, my oven went kaput. So, I wasn't able to make the bread as planned. That said, however, I'm glad my oven held out just long enough to make the bars. I did make some changes to the recipe. Since I don't have baking mix on hand, I whipped up a shortbread crust instead. Then, because you can never have too much chocolate, I doubled the amount of the filling. I also increased the amount of raspberry jam and swirled it into the filling. Finally, I left out the pecans due to allergies (although these would probably also be great with almonds or hazelnuts). All I can say is that these bars were amazing! So fudgy and rich. They tasted exactly like my favorite chocolate raspberry truffles (who needs See's after this???). 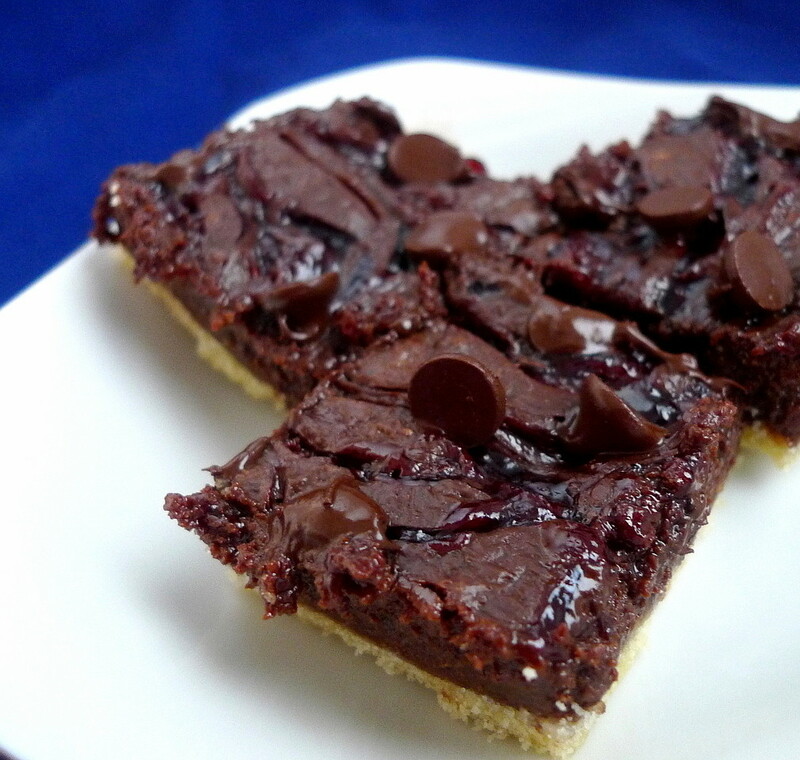 Doubling the chocolate filling was definitely a good idea since it made for the perfect ratio of chocolate to crust. And, they were super pretty to boot with that lovely jam all swirled into the top. I couldn't be more pleased with how they turned out and am so glad that I got to give this recipe a try. By the way, several weeks later, I got a new oven and made these bars a SECOND time for a church potluck. The whole plateful got scooped up in no time at all. Just goes to show how good these bars really are. They're truly an SRC keeper! Cream the butter with the sugar. Add the flour and mix until you have a soft dough (it will be a little crumbly). Press evenly in the pan to cover the bottom. Prick all over with a fork. Bake until the edges brown, about 15 min. For the filling, combine the condensed milk and 1 cup chips in a saucepan over medium heat. Stir continually until the chocolate chips melt and everything is well combined. Spread evenly over the hot crust. Stir the raspberry jam in a bowl until it is smooth. 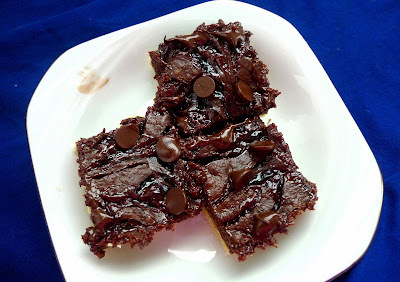 Dollop over the chocolate filling in lines and use a butter knife to swirl it into the chocolate. Sprinkle with the remaining 1/4 cup chocolate chips. Bake until the filling is set, about 30 min. Cool. Lift from pan using the foil and cut into bars.